My Gadget Repairs offers a system management software for repair shops, supporting over 500 users in 25 countries. The company specialises in offering tiered plans to support all types of businesses and as a result, they have a broad range of clients including IT, technology and electrical goods repairs through to furniture and jewellery repair shops. Following numerous requests from their users for an SMS integration, My Gadget Repairs was prompted to look for an SMS provider with a suitable integration. The team were also looking for a more direct and immediate way of sharing status updates tickets raised by their customers. 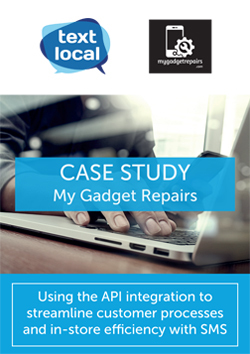 Textlocal’s API and supporting documents allowed the team at My Gadget Repairs to build SMS into their CRM software. By creating a more streamlined integration, their clients were able to use SMS as part of the customer journey without the need to operate more than one system. As well as offering a more rounded package that includes SMS for clients, My Gadget Repairs have been able to use SMS to keep their customers fully-up-to-date with the progress of their repairs. In-store processes are more efficient as shop owners are able to focus on completing jobs rather than answering or making calls and updating customers on the progress of the repair. Similarly, customers receive a better level of service with regular updates keeping them informed.